Zoodles seem to be taking over the world. What are zoodles? They are zucchini “noodles” made using a spiralizer, which creates long thin strands out of vegetables. I’m highly entertained by the fact that the British call them “coodles” because they call a zucchini a “courgette”. Coodles, zoodles, whatever you call them – they’re a perfect way to use up those zucchinis / courgettes that are everywhere this time of year. Low-carb fans often substitute zoodles for pasta noodles, but I like to make salads with them since I prefer them cold. This particular salad features a lemony oregano dressing with tomatoes, feta cheese and toasted pine nuts. Just the thing for a hot summer day! If you don’t have a spiralizer, you can use a vegetable peeler to create long, thin strips instead – or for this recipe, you could thinly slice the zucchini using, say, a mandoline (don’t forget your safety glove) or a sharp knife (it will look a little different, of course, since you’ll have thin slices instead of zoodles). Be advised that when you use a spiralizer, you’re creating ONE. GIANT. LONG. ZOODLE. You might want to cut it here and there to make eating it a bit easier. I pile one zucchini’s worth on a dinner plate, then slice it into “quarters” using a sharp knife. You can spiralize a lot of other veggies, too, not just zucchini. One day I’m going to try potatoes to make oven curly fries! If you’re embracing this whole zoodle thing, here’s another radish*rose zoodle recipe: lemony zoodle salad with Parmesan. Equipment: Spiralizer or vegetable peeler. Two dinner-sized plates. Small watertight jar. To make the dressing: In a small watertight jar, like a jelly jar, place the lemon juice, olive oil, oregano, agave nectar or sugar, a large pinch of sea salt and a few twists of freshly ground pepper. Tightly seal with the lid and shake until all ingredients are well combined and emulsified (thick). To make the zoodles: Peel the zucchinis, and slice off the stem end so it is flat. Attach whatever size blade you like to your spiralizer - I like the one that is noodle-sized, but you could make this with ribbons as well. Attach the flat end of the zucchini to your spiralizer and crank away to make the zoodles. Place one zucchini's worth of zoodles on each dinner plate. Using a sharp knife, cut the mass of zoodles into "quarters". This will make eating them easier, I promise! Assemble the salad: Slice your tomatoes into wedges and arrange on top of the zoodles. Sprinkle with feta cheese. Drizzle with the dressing, then top with pine nuts and parsley (if using). Serve and enjoy!! 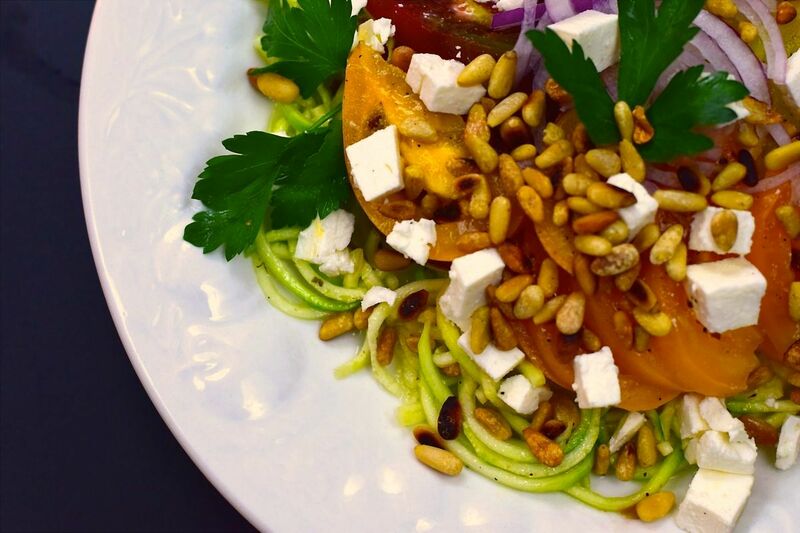 i love all these flavors (feta might just be one of my favorite cheeses), and i’ve been meaning to get around to trying spiralized veggies, so this will have to happen!